It seems like just last year we were reviewing a Dishonored game. Oh, we were – this one’s kind of DIshonored 2.5, but comes as a standalone adventure. We like that, you can lose track of what DLC you actually have sometimes. Actually, that story does go somewhere, as the hook mine is a super-cool weapon, and it’s yours. The ‘you’ part of that is Billie Lurk (aka Meagan Foster), sea captain, assassin and one-time witchy woman. This story very much revolves around you – as in the you who is Billie Lurk - who teams up with old mucker Daud, who also happens to be an assassin – a somewhat legendary one. Between you, a plot of enormous proportions is hatched – you’re going to kill the Outsider. Were he actually human then that might not be such a huge ask, but as he’s like all supernatural and stuff, have our assassinationtational pair bitten off more than they can chew? Then there’s the immoral ambiguity – didn’t the Outsider bestow the very skills upon our protagonists that they now intend to use against him? Bloody ingrates! 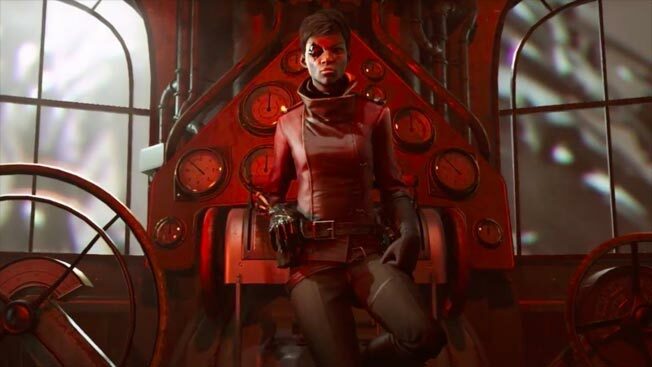 It shouldn’t need to be said, but we’ll say it anyway – this takes place after events of Dishonored 2, so if you haven’t made your way to the end of that then herein there be spoilers. Don’t think you’ll knock it over before supper with its misleading bargain price, either, as it’s a substantial outing. It’s also a blast, with a great lead character (still voiced by Rosario Dawson) who possesses cool powers, an involving tale and a masterful mix of stealth and challenging combat. Plus, Billie gives ace ‘Blue Steel’ on the cover. Hopefully we’ll be able to use the opening sentence here again this time next year.